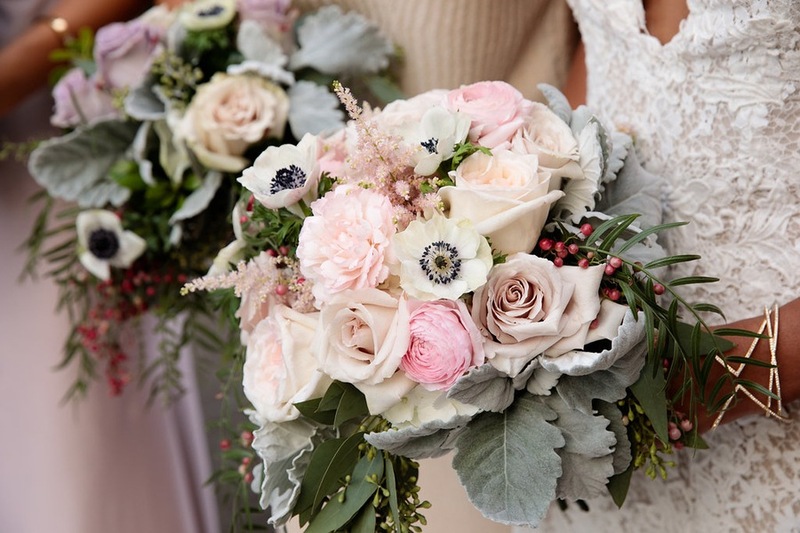 This modern metallic wedding is something to die for! 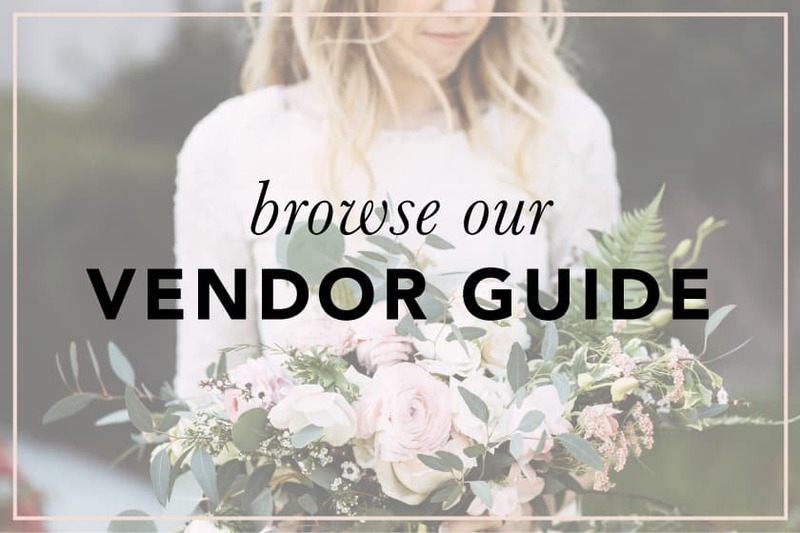 Usually modern means edgy, dark, and a tad cold, but this wedding proves that you can do modern while still keeping light, feminine, airy and warm. 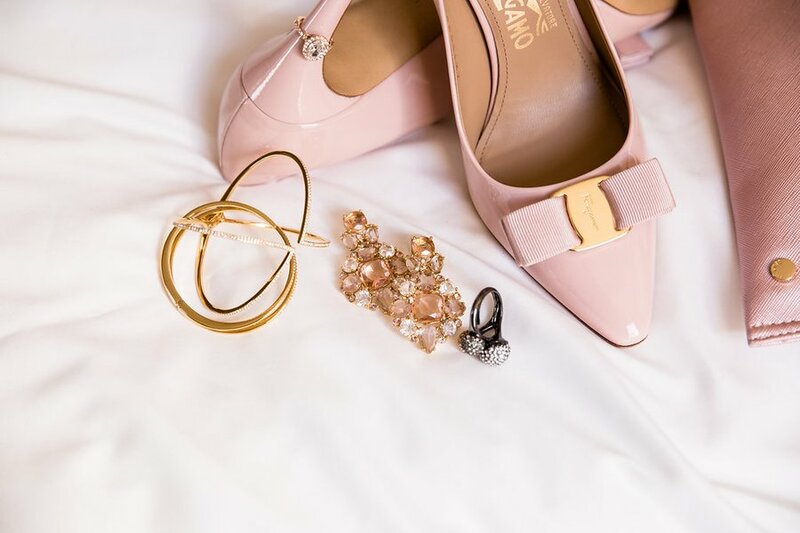 This bride chose to go with a lot of pink and accent with tons of gold. 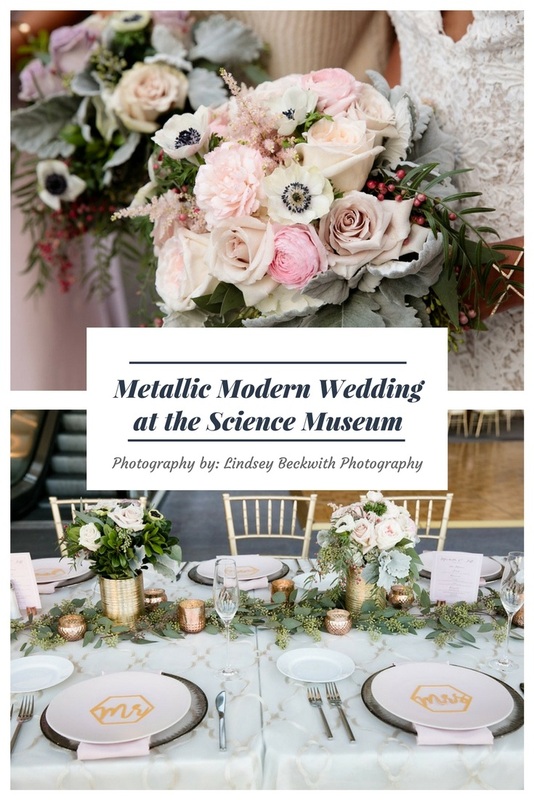 The results are fabulous as it incorporated beautifully in the museum they got married at. 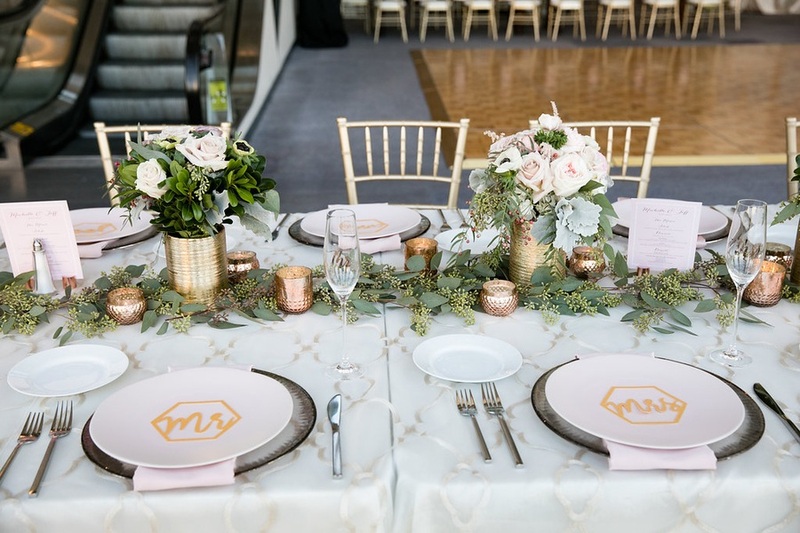 The reception was a dream, full of vibrant metallics and lots of amazing color to keep it fresh. 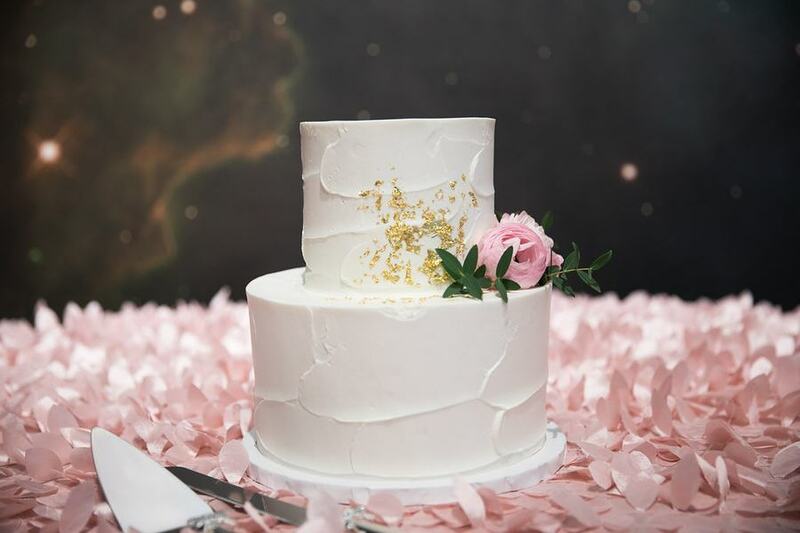 We love how this one turned out! 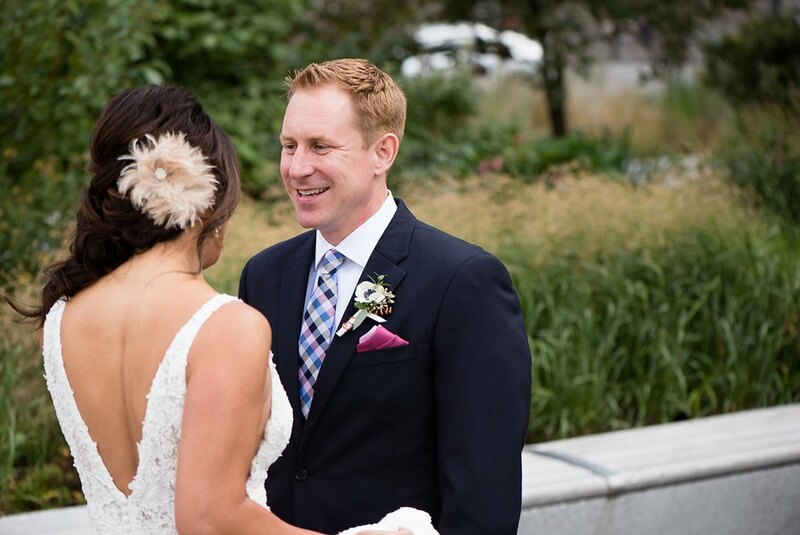 Marry the one who makes you laugh…Michelle and Jeff embody this quote about marriage advice. Every single meeting with this couple was filled with lots of laughter, jokes, and fun. Michelle and Jeff have had a fun relationship since the very beginning! 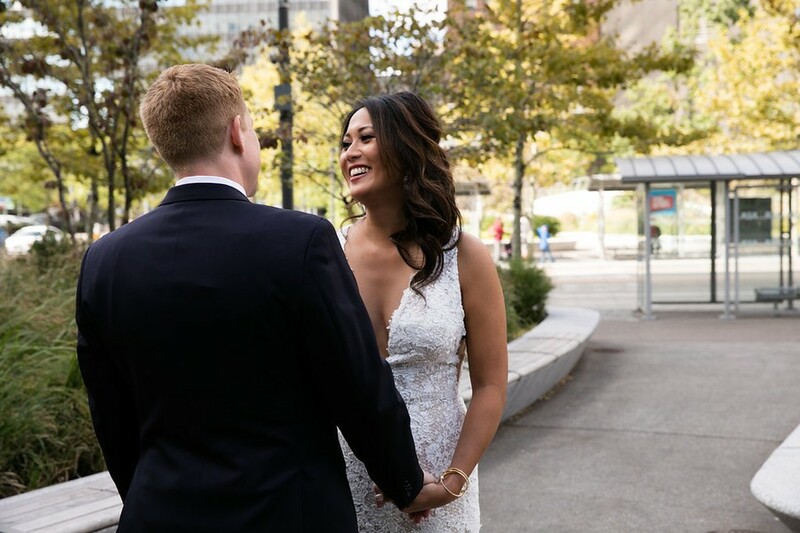 These two met at a work event but Jeff has always lived in Cleveland and Michelle has always lived in Los Angeles so they did what any potential couple would do for a first date, went on a cruise together! 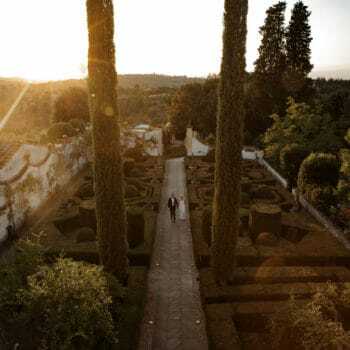 They started off their relationship on a high note and then the two were engaged in Italy and jumped right in to planning an amazing celebration that would bring California and Ohio together for one big party to start their marriage off on a high note too! 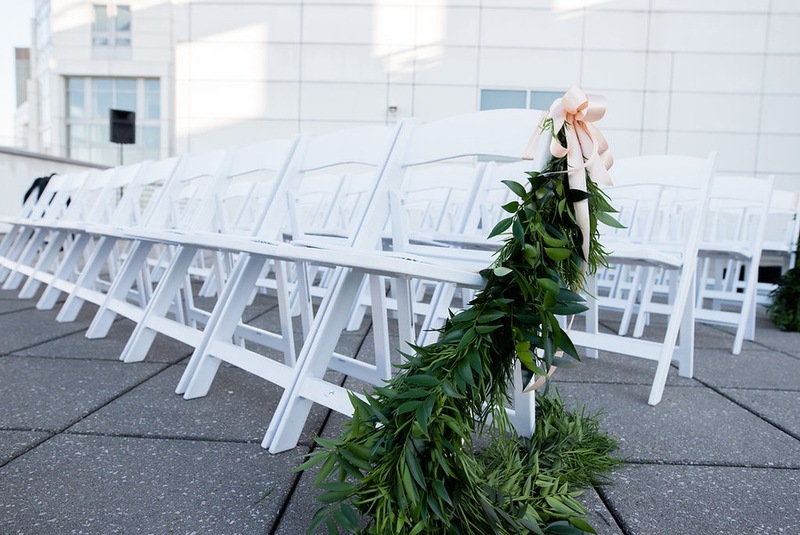 Michelle and Jeff wanted a very Cleveland venue for their wedding day that showcased downtown for their guests from California. 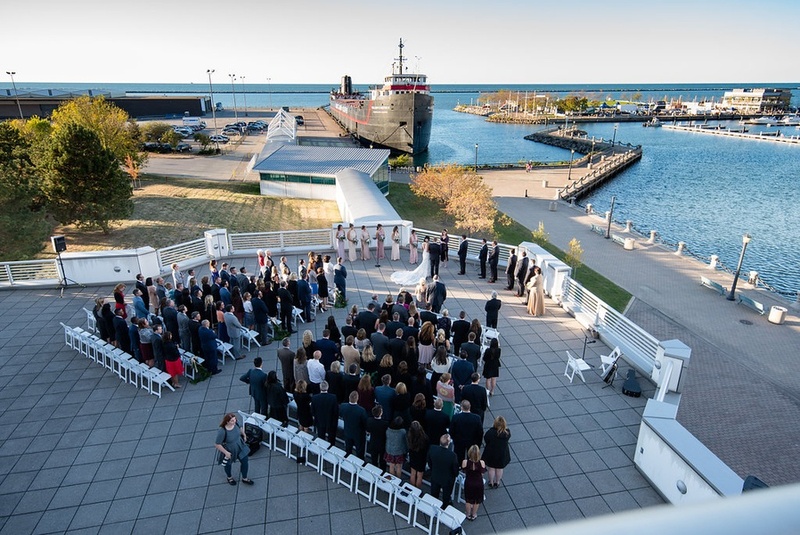 We planned their big day at Great Lakes Science Center with a ceremony right on the water and a reception in front of large windows overlooking Lake Erie and the Rock and Roll Hall of Fame – it doesn’t get much more Cleveland than that! But it couldn’t be only about Cleveland! 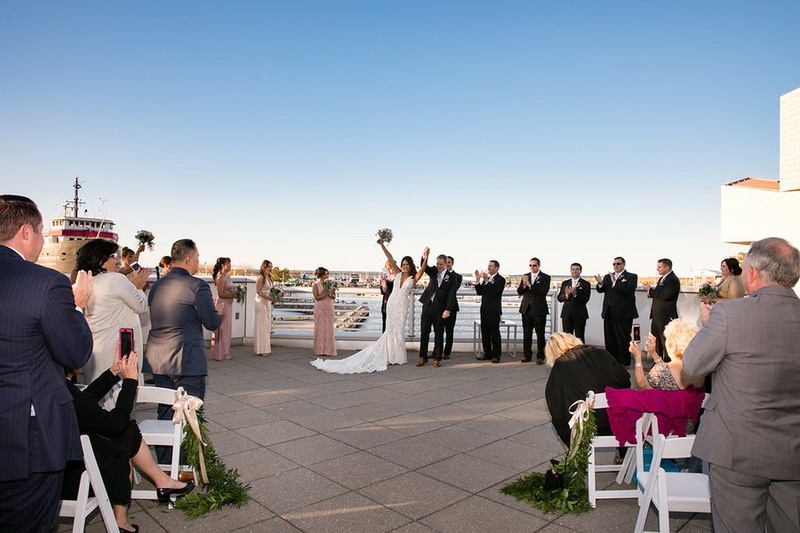 Michelle’s bridesmaids walked down the aisle accompanied by Athena Strings to my favorite bridal party processional on strings to date! If you have never heard California Love by Tupac played by a string trio I highly recommend it. 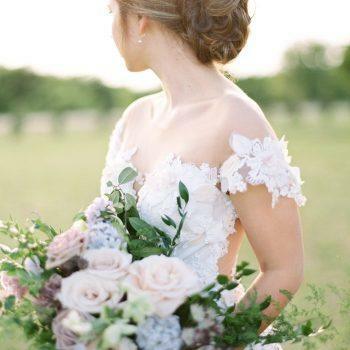 It was amazing and to quote Michelle it got her pumped up before it was time for her to walk down the aisle. 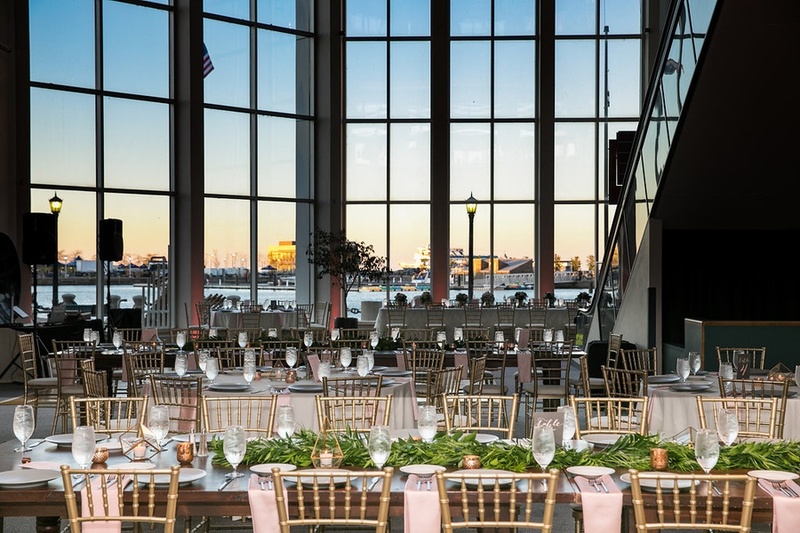 After a beautiful ceremony filled with emotional vows written by the couple themselves, guests were invited into the museum to enjoy not only traditional cocktail hour activities but also experience the museum’s exhibits and built-in cocktail hour activities! 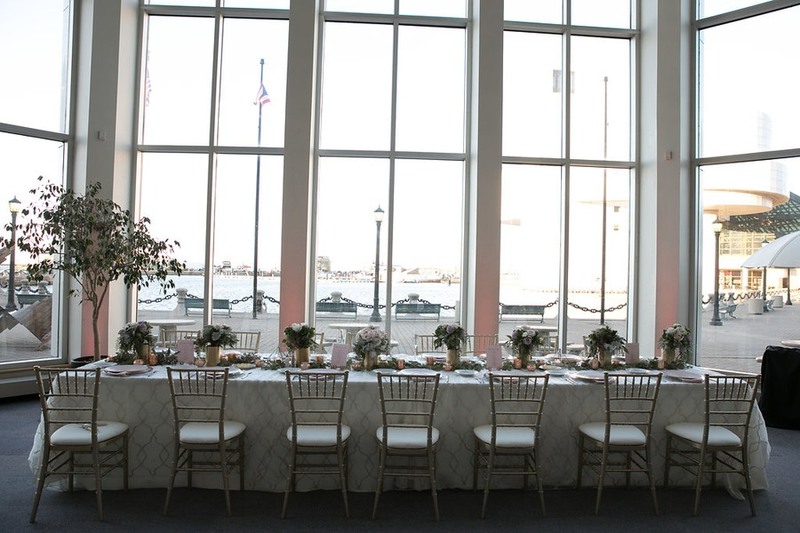 After this guests made their way to a candlelit reception during a stunning Lake Erie sunset. 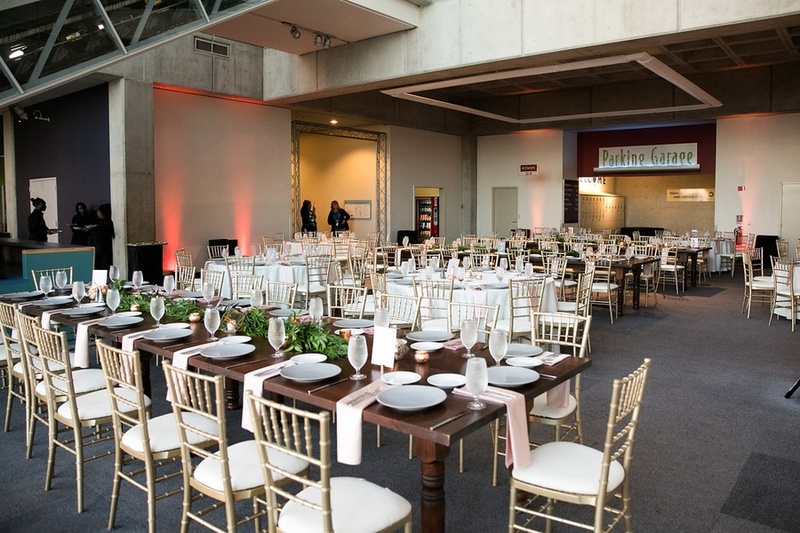 Michelle and Jeff wanted their reception to reflect the industrial feel of their venue and of Cleveland while still keeping things chic and feminine. 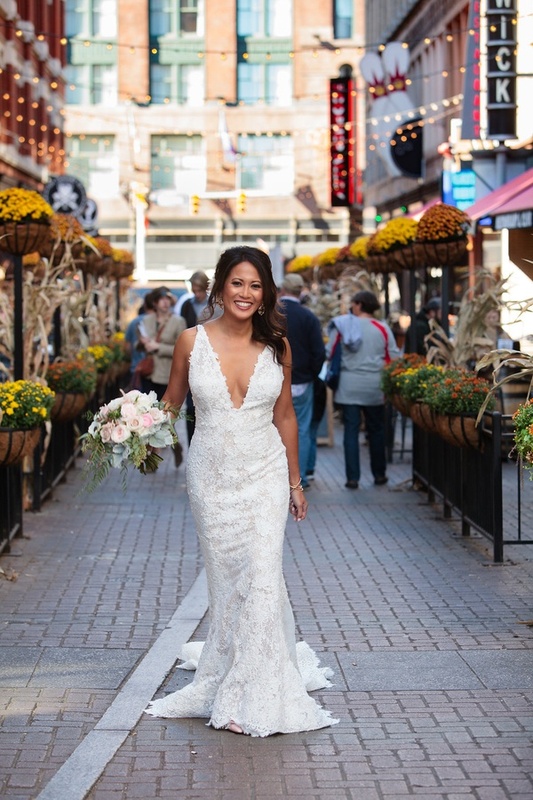 Another thing to know about our bride, Michelle, is that she has amazing taste and style! 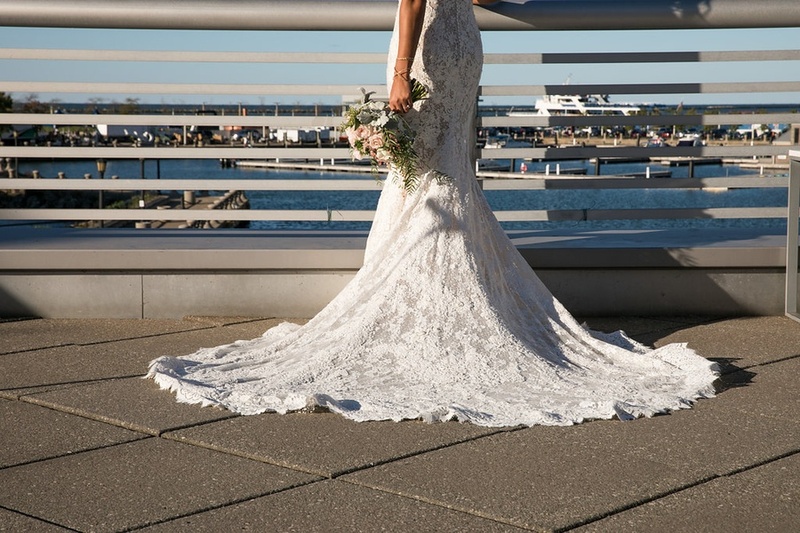 She wore not one, but two pair of chic designer heels with her stunning lace Pronovias wedding dress and she looked amazing. 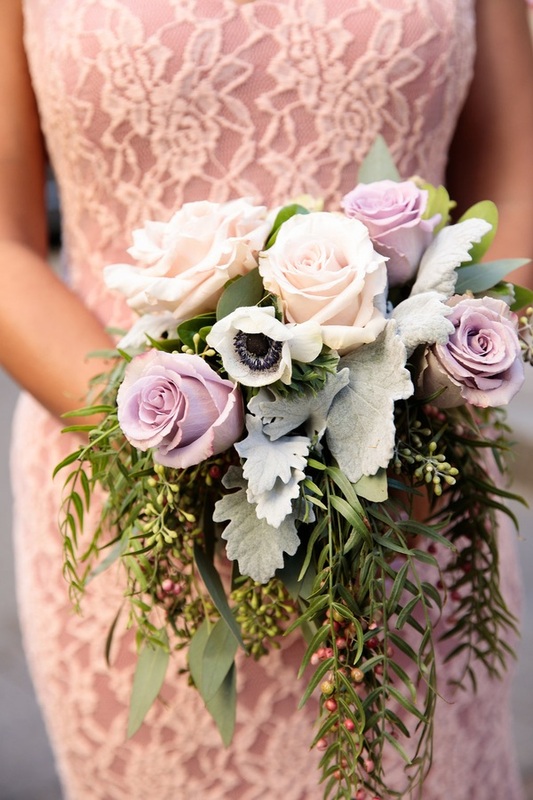 Michelle’s bridesmaids all wore custom dresses in shades of blush, mauve, and champagne and we carried this color palette through the entire wedding. 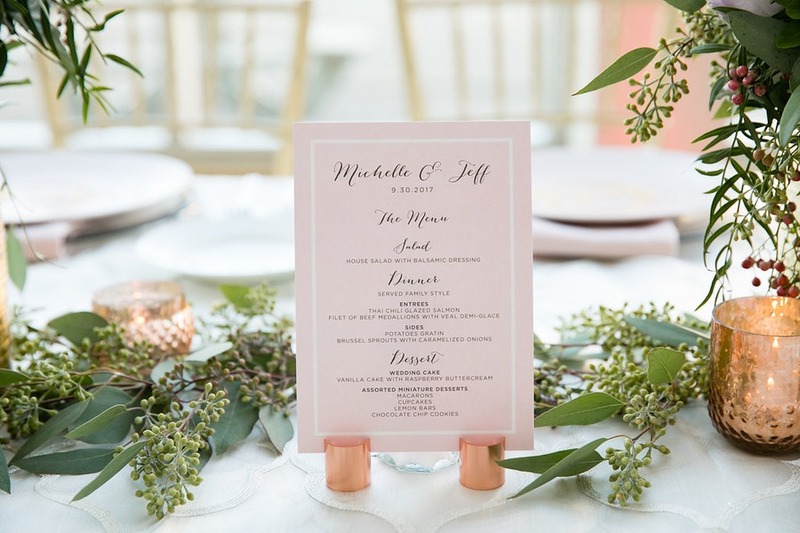 We adorned a mix of round tables and farm tables with beautiful heirloom dinner plates in grey and blush, blush satin napkins, and simple greenery runners and rose gold candle centerpieces with mixed geometric shapes. 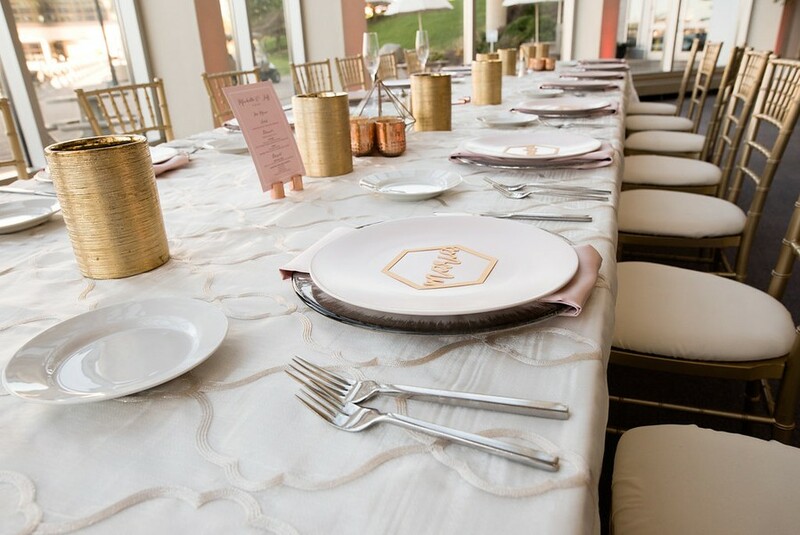 We incorporated mixed metals including copper stands for their table numbers plus amazing gold laser-cut hexagonal place cards for the head table. 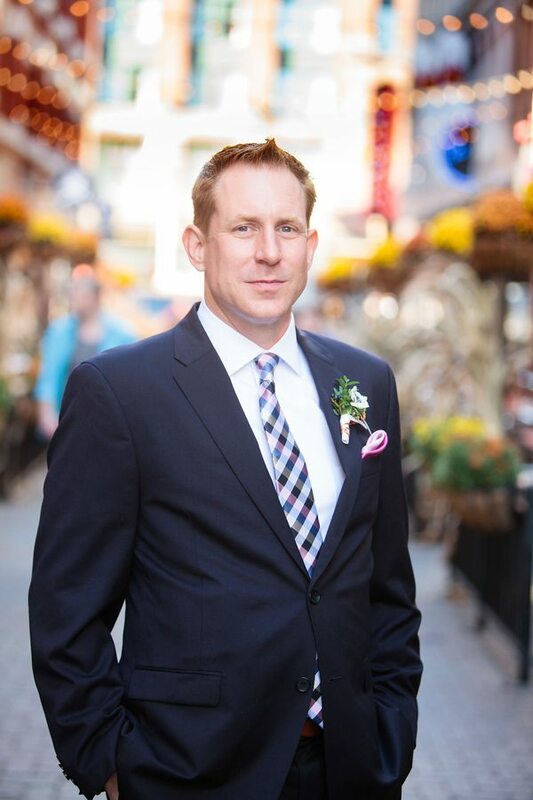 We even continued the mixed metals to the boutonnieres by wrapping them with copper wire! We also continued the Ohio marries California theme in details like a custom monogram merging the two states with a heart where LA intersects Cleveland and even had custom cookies made to match this as favors for guests as they exited the reception. 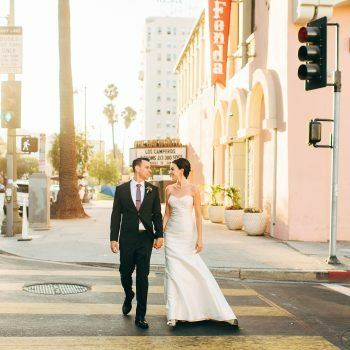 Like I said, Michelle and Jeff had a fun relationship from the very beginning and that did not stop with their wedding. 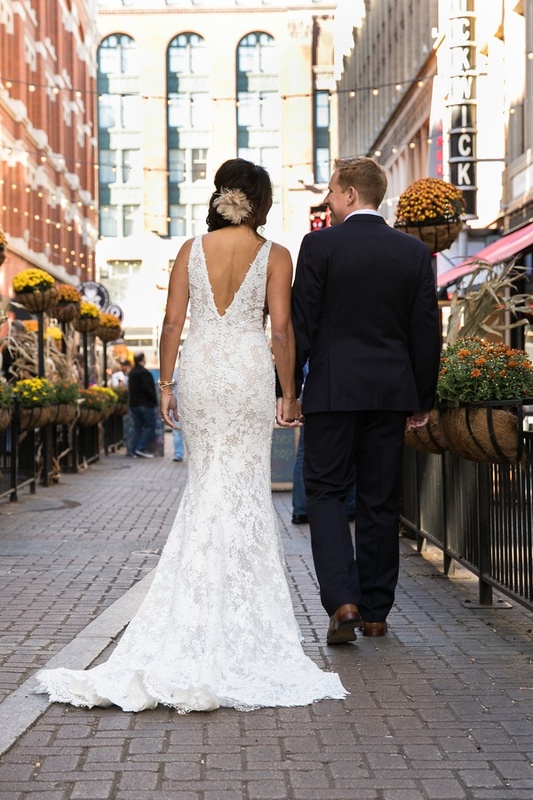 It was so clear that these two were having the time of their lives and it was such an honor to help make this beautiful day happen. 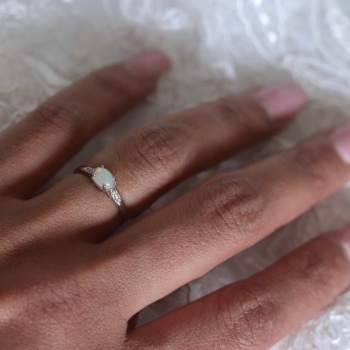 Breathtaking Hawaiian Wedding- You’ll Never Have Seen Anything so Beautiful!